The James Moffett Post No. 223 was organized on August 12, 1883 showing some thirty charter members. John B. Anderson, the ﬁrst Post Commander, was then followed by D.A. Thompson, K.D. Hawley, and Jefferson Huffman. Fort Donnellson Camp No. 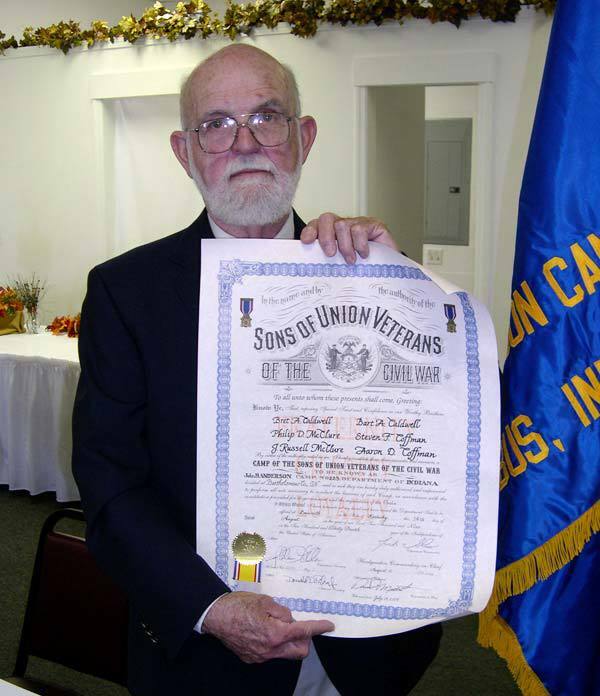 66, Sons of Veterans, was mustered in July, 1887, and organized on November 28, 1887 with twenty-three charter members. The John S. Crump Camp, No. 32 was organized on July 2nd, 1897, and mustered in by Past Division Commander Frank Martin, of Indianapolis, with forty-six charter members. At this time, delegates were elected to attend the Division Encampment at Marion on July 6th and 7th, and were instructed to urge the selection of Columbus as the place for the 1898 Encampment. The delegates were, J. W. Prall, C.C. Brown and Capt. W. A. Stevens, were successful in their efforts. The Camp is named for John S. Crump, who is one of Columbus’ most progressive citizens. 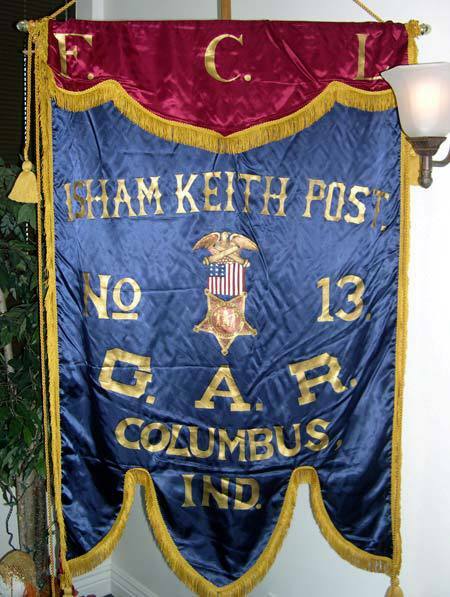 Isham Keith Post No.13, G. A. R., was granted a charter January 15, 1880, and included the greater part of the ex-soldiers of the city and surrounding counties. At first it was called Columbus Post, but afterward changed in honor of Lieut. Col. Isham Keith, a gallant young officer from Columbus, who was killed at the battle of Perryville, Kentucky. The principal officers were George H. Clutch, Commander; Daniel Judd, Senior Vice Commander; Ward Salmond, Junior Vice Commander; and S. M. Glick, Adjutant. The post was in existence until 1934. As auxiliary to this post. Lookout Camp No. 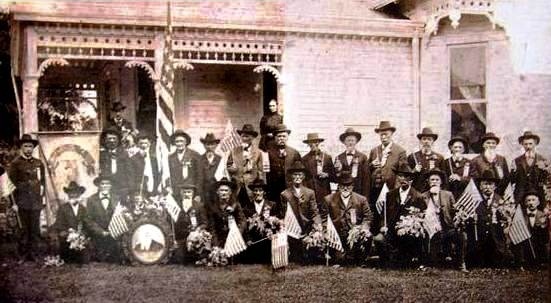 32, Sons of Veterans, was organized in February, 1887, and enrolled many of the best young men of the city. The officers were J. H. Arnold, Captain; J. W. Smith, First Lieutenant; and William Stevens, Second Lieutenant. The Women’s Relief Corps. No. 69, of the Isham Keith Post, was not organized until August, 1887. The officers were: Mrs. Ward Salmond, President; Mrs. N. C. Spurgin, First Vice President; Mrs. C. N. Spencer, Second Vice President; Miss Maggie Hopkins, Treasurer, and Mrs. I. M. Brown, Secretary. The John B. Anderson Camp, No. 223 was organized on November 7, 2009, and mustered in by Indiana State Department Commander Jack Shaw, with six charter members. The first officers were Philip D. McClure, Camp Commander; Bret Caldwell, Camp Senior Vice Commander; John Russell McClure, Camp Junior Vice Commander; Steve Coffman, Camp Secretary; Bart Caldwell, Camp Treasurer; Aaron Coffman, Camp Chaplain; and Philip McClure, Camp Monument Officer. The Camp is named for Civil War veteran John B. Anderson from Company G of the 6th Indiana Volunteer Infantry, whose story is told on the Home page.